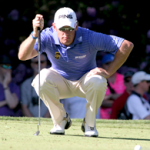 Although the outcome wasnât exactly what Lee Westwood had in mind, finishing tied for third in this yearâs British Open showed that his golf game is solid and improving since moving to Old Palm Golf Club. If not for a few pulled drives and a brilliant final round by winner Phil Mickelson, Westwoodâs name may have been carved on the Openâs famed Claret Jug. âI didnât play badly,â said Westwood in a post-championship interview, âbut I didnât play great.â His finish matched his best performance in a major championship since 2010, and while disappointed, Westwood was philosophical and candid about his play. âYouâd like to come in ripping it and with every part of your game in good shape, but sometimes itâs not. So you just have to make due with what youâve got.â When the new World Golf Ranking were announced the next day, Westwood had moved up two spots into the Top 10, with fellow Old Palm residents Louis Oosthuizen and Charl Schwartzel ranked 12th and 13th, respectively. Next, Westwood will play in the WGC-Bridgestone Invitational, and you can be sure heâll be light-hearted and smiling as usual. âRarely do I get in a bad mood,â he said, after the British Open.